Editor’s note: The following is the transcription of an interview conducted by Jutta Reichardt, Germany, with a Wind Turbine Syndrome victim named Christine Breda. Ms. Reichardt did the English translation. September 2010: Jutta Reichardt’s Interview with Christine Breda, Osterstedt, Schleswig Holstein, Germany about her life with windturbines and their effect on her health and that of her cockatoos. Jutta: Where have you experienced windturbines and how far away were they from your home? Christine: Initially in Reher, Schleswig-Holstein. We moved there in September 2000. The first windturbines had already been erected outside the village. I think that there were 4 or 5 of them. I believe there are now 12 to 15. They must be about 2 kilometres away from our former house. Jutta: How long did you live with them? Christine: I work mostly at home, freelancing. This means that on days when I could do my telephone calls, I was at home all day. This amounted to 3-4 days a week, from 2000 to 2009. My migraines became worse and worse. Until a month ago I had attacks every ten days. Also, they lasted increasingly long, from 2 to 6 days. If you take into consideration that I have to drive a lot for my job and am affected by vision disturbance, faintness and pain, all as a result of the turbines, then you can imagine that the situation has affected me professionally. I have had many appointments with doctors, everything from physiotherapy (two years of it), acupuncture, and electric shock treatment. Nothing helped. Only walks through the woods well away from the windturbines have helped. Since we have moved to Osterstedt, the attacks have decreased to one every 4 to 8 weeks. This is a real improvement, because I am much better able to work effectively. I have done nothing other than to move to an area where there are no windturbines. 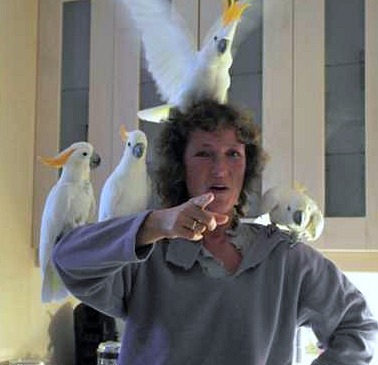 Jutta: You mentioned strange behavior by your birds, the cockatoos, in your previous house? What has been the result of your move? Christine: Our birds were okay until we built them an outside cage in the garden in Reher, where we used to live. Until then they spent most of their time in the house. As soon as we moved them outside, two of the birds began to tear their feathers out and all four of them became unbearably loud and squawked a great deal, which they had previously never done. The neighbours complained, quite justifiably. It reached the point where I could no longer leave them outside for any length of time. I couldn’t explain it since I had previously only known them as quiet and peaceful animals. I had raised them since they were chicks, and they had had no bad experiences until then. Jutta’s remarks to this change of behavior: Animals react to infrasound according to their sensibility. Atypical behavior has been noted among alpacas in the USA, goats in France, cows in Japan and horses and dogs in the USA, Germany and in Sweden. Dr Pierpont’s book about Wind Turbine Syndrome documents the effects of the windturbines, not only on people, but also on animals. Christine: After the move away from the windturbines in Reher, the animals gradually ceased to tear their feathers out. Since we have moved here to Osterstedt, our immediate neighbors have asked us whether we actually keep birds, since they have heard nothing! In order to reduce their stress (cockatoos are very sensitive sorts of parrots), we tried to construct an outdoor cage as similar to the previous one as possible with the same perches and colors as before. They have become so peaceful that I am sometimes a little concerned that they are okay.